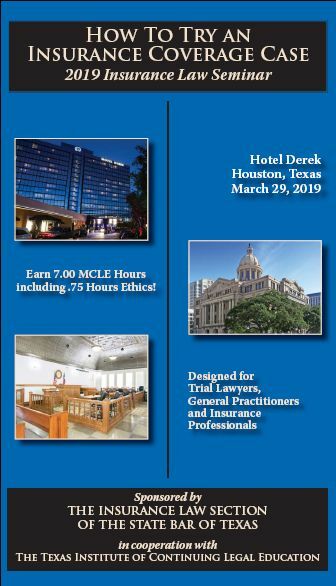 The Texas Institute of Continuing Legal Education offers a variety of live seminars and conferences offering CLE credit. See below for the latest upcoming seminars. 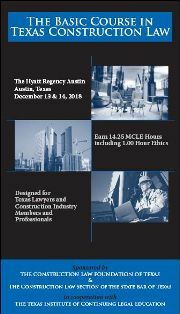 2019 Insurance Law Seminar - "How To Try an Insurance Coverage Case"
Download the official brochure & materials order form. 2018 RGV/South Texas Insurance Law Seminar: "Insurance Law for Trial Lawyers & General Practitioners"
Download the official brochure and order form. Download the course brochure and order form. "USAA v. Menchaca: The Texas Supreme Court's Latest Pronouncement on Insurance Bad Faith"
The Gathering Storm: What to Expect from the Anticipated Flood of Harvey-Related Litigation"